This week is one needing comfort food. No sanguine Thai noodles or salad is going to sort things out. There’s been a cold snap, a brisk shower of sleet and some nasty winds and everyone seems unsettled. At every dinnertime, the only interest I’ve had is in the warmest, most loving food possible. Butternut squash goes with smoked bacon for the same reason scrambled egg does; or macaroni cheese. The smooth, light texture turns up alternately chewy and crunchy bites and the flavours are rich and sharp, smoky and salty and that is what we want. Oh yessss siree. Take 1 butternut (of indeterminate age is fine as it turns out), chop into squares and douse in EVOO, salt, garlic, thyme (or anything you have) and pepper. Be brave with the salt. Stick it in the oven on about 200 C for 15-20 mins. Get the risotto on. This is the version of the day, even if anyone who knew what they were doing would hold their hands over their eyes in horror. Chop an onion, clove or two of garlic, half a carrot, a celery stick and saute until mainly soft and translucent. Add a couple of handfuls of risotto rice (your guess is as good as mine) and coat the grains in the mulch. Sling in a wineglassful of wine, white or rose, all fine as long as its drinkable. (In my case, Pinot Grigio Rose that had been hanging about in the fridge for a day too long). Stir it until the wine is absorbed and then start adding glugs of stock. All you need do is stir and add stock. Whether you do it in a paranoid frenzy or unhurried and steady, the results will be the same. 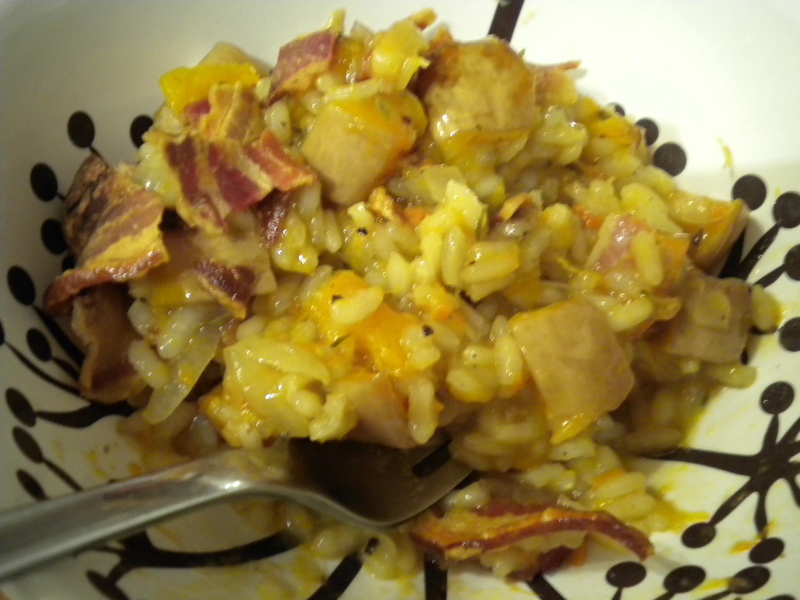 As the rice begins to swell, pull out the roasting squash, mix it around and lay a few rashers of bacon over the top. Back into the oven. This is where the choice of bacon makes all the difference. If you buy cheap, supermarket bacon, full of water and preservatives, it will most likely become hard and tough. Not the effect we’re looking for and even if it’s a cheap product, it doesn’t necessarily follow with a cheap price. If you buy expensive dry cure bacon, same price, usually less of it, it also hardens but becomes brittle and crunchy or chewy. When the risotto grains are fluffy and unctuous, suspended in plenty of starchy squelch, tip the squash into the rice, mix until it looks balanced and scissor the more flexible bacon pieces over the top. Stir them in. Dole out into bowls and crumble the well done (double smoked) bacon over the top and some fresh parsley if you want. Seriously, this writer is wise, intense and doubtless a good read. Jane Isaac’s book, An Unfamiliar Murder is totally available on Amazon.co.uk and Amazon.com as well as hopefully in a bookshop near you. It’s going to be the next book I read. Well done, Jane! I hate waste. I just hate waste. It makes me cringe when I’m in my most energetically enironmental and fills me with guilt when I’m lazy and can’t be bothered. Whether it’s a lonely last bite of food on a plate (or even the gravy) or the bones of a bird thrown out without boiling, I can’t. Bear. Waste. So here we have a chicken. 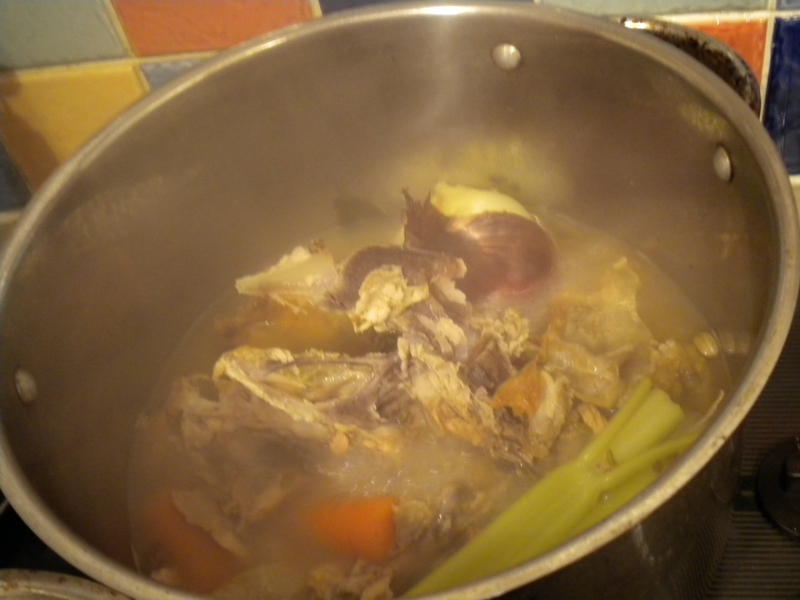 Yesterday it did us roasted with potatoes, carrots and a whole onion, all in the same tin; today it was chicken and leek pie, with brocolli and peas and now its dull carcase is stuffed in my stock pot, boiling with a large onion cut in half (no need to remove the skin), 4 bay leaves, a handful of fennel seeds, a carrot and a celery stalk. It’s not pretty but tomorrow I can either make some kind of winter veg soup or even risotto. I’ve been on the search tonight for blogs that interest me. I haven’t gone far to look, just a flurry of lazy clicking on WordPress’s Freshly Pressed. And so far I’m not impressed. It isn’t that the subjects aren’t interesting and it isn’t always the quality of the writing itself (as much as I can tell). It’s just that for me there has to be a distinctive point of view and so many blogs seem to just describe without opining. Maybe I just keep picking those ones. I always read at least two posts before I relegate them to the bin. I never believed that you could find something on the telly by flicking, so I’m not going to suddenly believe that works with blogs. Here are a couple that do get me. I don’t know if the subjects are interesting in themselves, but because the writer’s take is clear, I want to read. Tammy lives in Iowa and is an internet content writer by day and SuperMum by night. 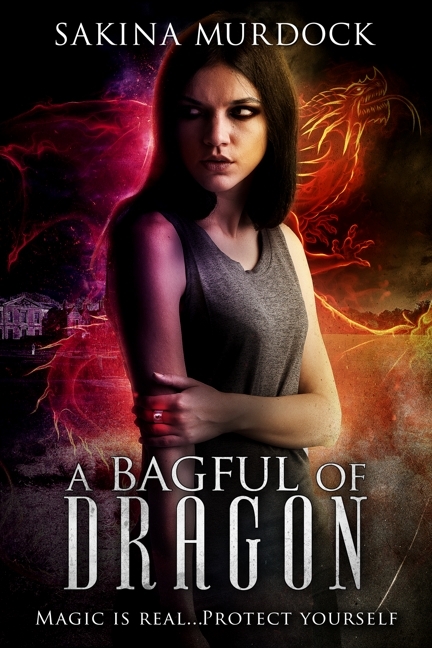 She’s also a fellow author at Rainstorm Press but that isn’t why I’m plugging her. Everything about her writing is honest in an open sense and what’s more, she writes every day, which gives you something to look forward to. I liked the voice of the writer again, where she bewails in matter-of-fact tones the perils of awkwardness. She tries too hard sometimes, but I like that, because it strikes me and makes me read carefully instead of skimming over the words. I’m glad there are a lot of sites out there that don’t take my fancy. People should do / say / write / things that are meaningful for them. 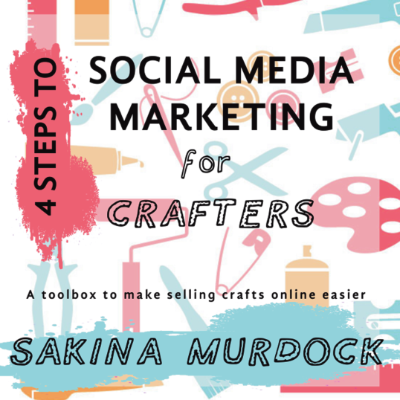 Followers are the Special Edition Extras on the back of the blog and its great if you even touch one person. If everyone was the same… well you know. You would have thought we were going to have enough excitement for one evening. We were on our way to a proper dance tonight, the sort where couples of an older age bracket and one or two baby boomers tango and waltz the night away. The idea was to introduce Himself to the concept of aerobic exercise, give Magpie the chance to learn to move elegantly, and to spend the evening doing something other than arguing in front of the fire. But oh no, the policeman had other ideas. He made the outing just that little bit more exciting; the type of exciting that had Himself champing at the bit and Magpie filing a complaint with Cumbria Constabulary’s HQ. There appeared to have been an accident on the A685 on the way into Kirkby tonight. Two cars, quite far apart, round a sharpish bend and police cars either side and in between. The queue of traffic was impatient, several people turning round and driving back up the road, but it was moving, if slowly. The cars didn’t seem to be very damaged. On our way back out, the queues seemed to have disappeared and as we rounded the bend, lights blazed over two pickup lorries with the cars loaded. The road was clear, so we drove on, and a light appeared – I don’t think I registered it until it shone so brightly into our windscreen that we couldn’t see anything at all. Himself asked why that idiot was driving towards us twice, when I realised it was a person with a torch and shouted at him to stop. The policeman who had been walking towards us, doubtless in fear for his life at one moment, snatched open the driver’s door and yelled at Himself from a foot away. He demanded to know things like why we weren’t paying attention to what was going on and why didn’t Himself speak, instead of just staring. Then he wanted to know what Himself had taken, even lowering his voice once to ask me. He asked and said everything twice, even when he told Himself to put his seatbelt on. I asked my dad’s advice as we drove, now late, to our dance and he was very sensible. He advised me to telephone the HQ, speak to the Duty Inspector, explain the story and ask for it to be logged on the computer. He said the last thing we wanted was that traffic officer to spend the next 6 months following Himself up hill and down dale. So tomorrow morning, I’m waiting for the officer’s Inspector to phone me back.Turns out the ‘accident’ was probably connected to a rumoured police chase during a series of drugs raids, though everything is very shady. And the dance? It was of course, sweet, fun, good to learn something new, had the dubious joy of being held too closely by a man older than my father – Himself got the man’s wife – and breaktime consisted of a cup of tea and a biscuit. Himself sweated profusely at the unexpected effort and I actually enjoyed the gentle dancing. 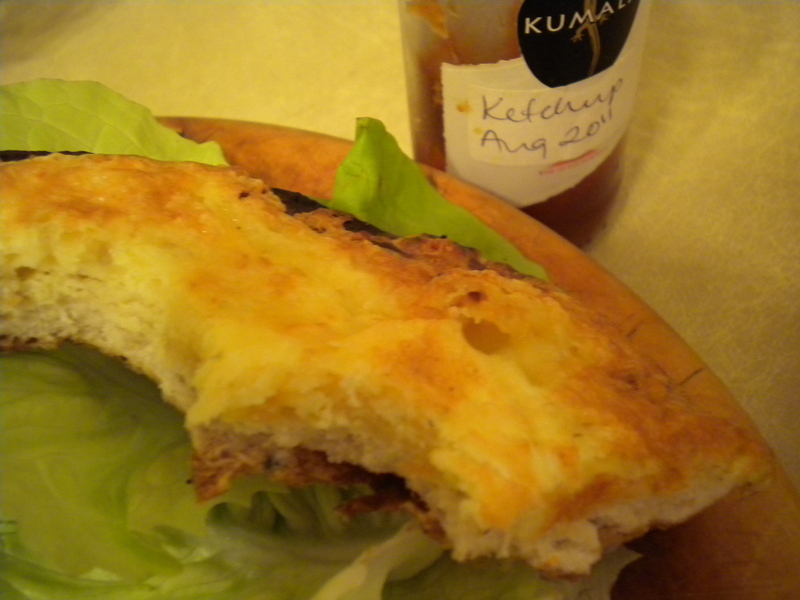 Supper was welsh rarebit on naan bread with a cuter side salad than what is shown in the picture. Grill one side of the bread. Take 2 eggs, beaten lightly and fill up their viscous liquid with grated cheese (sharp cheddar is best) until thick and gloopy. Spread it onto the untoasted side of the bread and put it under the grill. Toast until the cheese is mottled and eat by itself, or with beans, or with tomato ketchup and a side salad with onions (very important). I didn’t achieve a lot today, but I felt good. The daily waterfalls are kicking in and my outlook has cheered up. 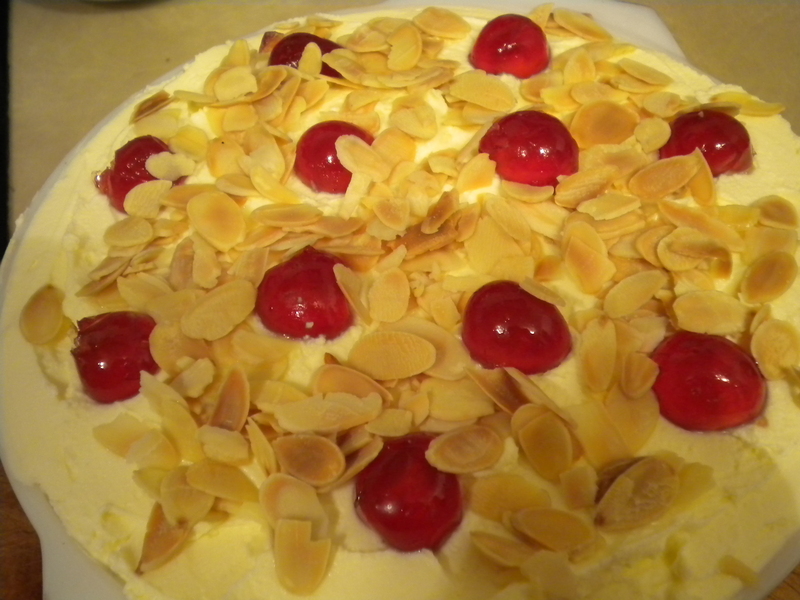 Today I wish there was some trifle left, because my day would be topped with a cherry. The sherry soaked sponge soaked, sharp raspberries stabbing the silky smooth custard; lightly whipped cream and jewelike cherries competing with toasted flaked almonds. It’s busy but simple. Well, that’s how my mum’s trifles turn out. There’s an air of finesse, in a dish that isn’t very sophisticated. Each layer should be distinct but also meld with its mates to make one amazing pudding. This baby was my first ever, and it got eaten right up, so the hitter it was, however there were a couple of mistakes that I would want to do better next time. 1) A very large slug of sherry w as added by Himself because he thought it was funny, so the dessert was overwhelmingly sherry flavoured. 2) I used a flat whisk (with the spiral loop) which whipped the cream too stiffly, without warning, so that wonderful softness was lost. 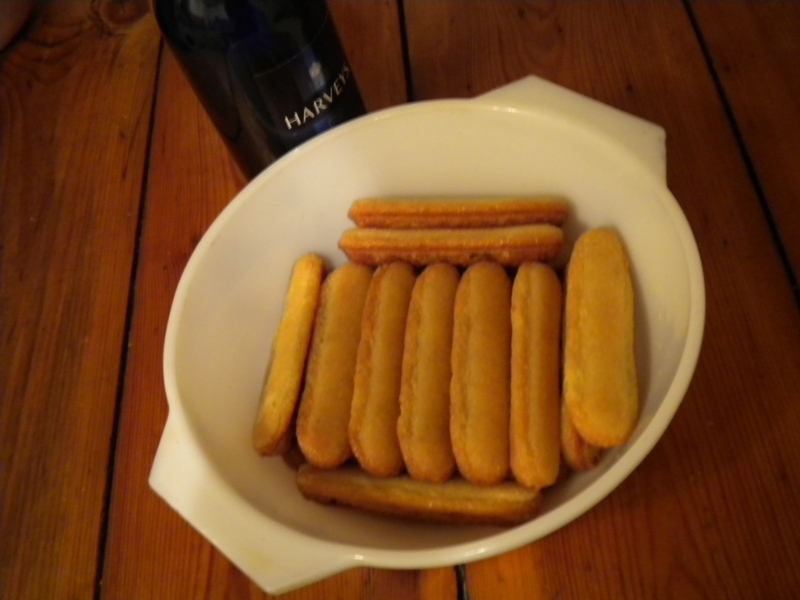 As many “Lady’s Finger” trifle sponge biscuits as will fit on the bottom of the chosen dish. Two layers if the dish is deep enough to take it. Soak them in sherry, one slug at a time; soaked is not soggy. Lay a thick layer of raspberries (fresh or frozen – no need to defrost) over the sponge and make the custard. Custard: I keep old vanilla pods in my sugar, so I have vanilla sugar available – just as well since I forgot to buy a pod this time. Using the ratio of 1 egg yolk per 100ml cream and milk, whisk together the yolks and 1 tbsp vanilla caster sugar. Add 1 tsp cornflour (I put slightly more to be certain). Mix in a combination of milk and double cream and set on a low/medium heat. Stir with a wooden spoon until it thickens. Do not boil. Keep stirring after it’s taken off the heat. Scratch custard is so much nicer than Birds. 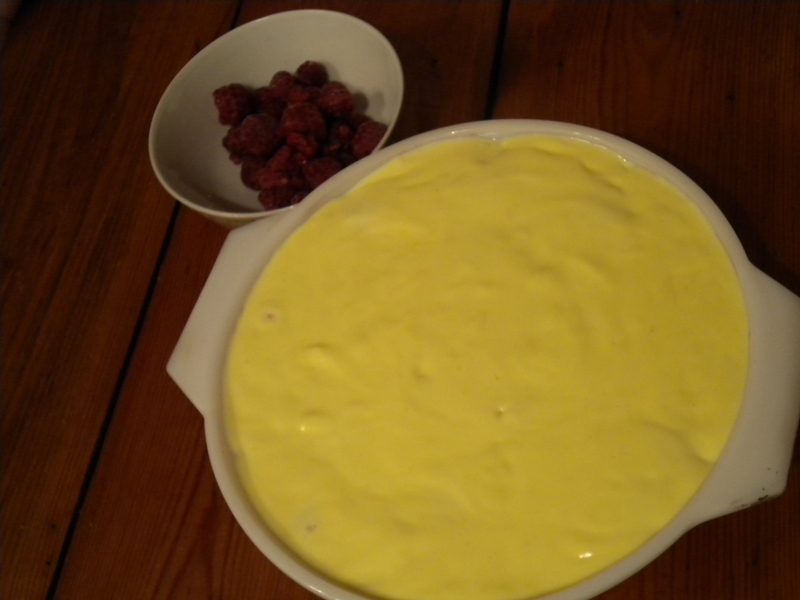 Pour the warm custard over the raspberries and allow it to set overnight in a cool place. Put the oven on 180 C and toast a layer of flaked almonds on a heatproof dish. Whip the double cream lightly and cut 8-10 cherries in half. Dollop the cream over the set custard so that it covers it – a pallette knife is a good tool for this – and set the cherries into the white stuff under a covering of nuts. I know I’m bragging. I know I shouldn’t. 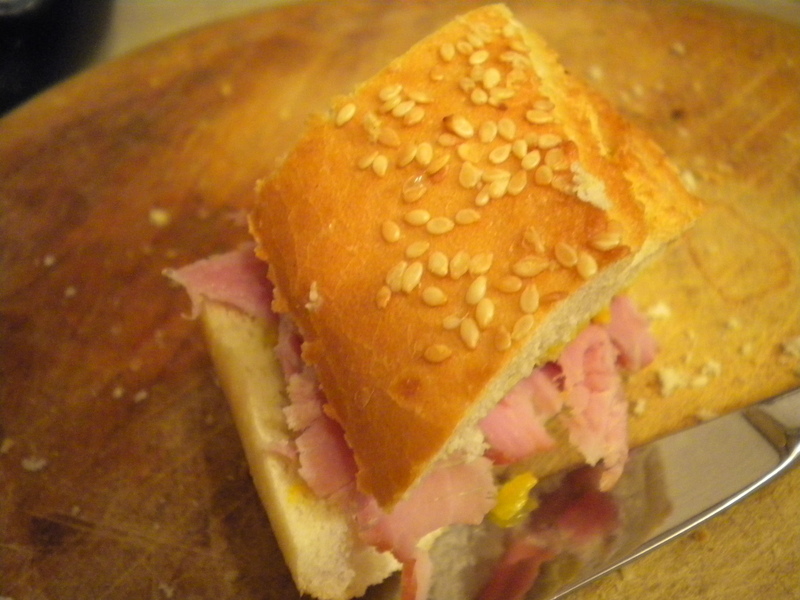 But I made the best cooked ham ever last night and I have to show it off. See it here in a tiny ham and piccallili sandwich. Sharp, salty, acidic with the vinegar, and its background of vegetables and cider lends a savoury depth. Plus the butter and white bread combination, a guaranteed win.